I have been working in the field of luminescence and electron spin resonance (ESR) dosimetry and its application to Earth and Planetary Sciences. I have worked on luminescence of various dosimetric systems, viz, extra-terrestrial material (meteorites), natural terrestrial samples (aeolian, fluvial sand deposits, moraines and volcanic ash) and synthetic dosimeters (e.g. Al2O3:C, CaF2). I am seeking for an understanding of mechanistic luminescence phenomenon and how it can be implemented to understand various geological processes in the past Quaternary. My present research is focused on quantification of erosion of mountains. Towards that I am using thermoluminescence (TL) to establish it as low temperature thermochronometer. The advantage of TL is that a single TL glow curve has a wide range of thermal stability (<ka to Ba), and hence provides multiple thermochronometers with a multitude of closure temperatures. Methodological development includes understanding kinetics of natural dosimeter, feldspar, and numerical modeling to quantify recent thermal histories of rocks. We plan to apply this new methodology for different geological settings, very low- to high-exhumed area to understand erosion histories of very recent (~few tens of ka) to whole Quaternary range. I was trained in physics from IIT Bombay, India in 2006 and the did my Ph.D. from Physical Research Laboratory, Ahmedabad, India in 2012. The thesis titled “Luminescence dosimetry of terrestrial and extra-terrestrial materials: New Applications”. As a part of my Ph.D. thesis work, I established methodology to estimate the cosmic ray exposure ages of meteorites using natural luminescence and anomalous fading as proxies through systematic experiments and numerical simulation using GEANT4. Later, I was involved in the dating of tephra under Japan Society for Promotion of Science (JSPS) project titled “Comparative study between thermoluminescence (TL), optically stimulated luminescence (OSL), and electron spin resonance (ESR) dating techniques to date tephra up to 1 million years old” during 2013 to 2015. Since October 2015, I am in Institute of Earth Surface Dynamics, University of Lausanne. H. Biswas, 2014, Development and Application of Luminescence to Earth and Planetary Sciences: Some Landmarks. Defect and Diffusion Forum, 357, 217-243. Bhattacharjee, V. Jain, A. Chattopadhyay, R.H. Biswas, A.K. Singhvi, 2016. Deciphering polyphase neotectonic activity in a shield area through analysis of surface processes: a case study from Gavilgarh Fault Zone, central India, Tectonophysics, 2016, 199-217. H. Biswas, S. Toyoda, M. Takada, Y. Shitaoka, 2015. Multiple luminescence and ESR dating approaches to date Japanese marker tephra, Quaternary Geochronology, 30, Part B, 350-356. K. Mundupuzhakal, R.H. Biswas, S. Chauhan, V. Varma, Y.B. Acharya, and B.S. Chakrabarty, 2014. Effect of thermal annealing on Nano-calcium Fluoride towards its thermoluminescence properties: implication to dosimetry, Radiation Protection Dosimetry, 10.1093/rpd/ncu33. H. Biswas, B.C. Bhatt, and A.K. Singhvi, 2013. Effect of optical bleaching on the dosimetric TL peak in Al2O3:C for blue and UV emissions, Radiation Measurements, 59, 37-43. Varma, R.H. Biswas, and A.K. Singhvi, 2013. Aspects of Infrared Radioluminescence dosimetry in K-feldspar, Geochronometria, 37, 266-273. H. Biswas, and A.K. Singhvi, 2013. Anomalous fading and crystalline structure: studies on individual chondrules from the same parent body, Geochronometria, 40, 250-257. Nawaz Ali, R.H. Biswas, A.D. Shukla, and N. Juyal, 2013. Chronology and climatic implications of Late Quaternary glaciations in the Goriganga valley, central Himalaya, India, Quaternary Science Review, 73, 59-76. H. Biswas, M.A.J. Williams, Rachna Raj, N. Juyal, and A.K. Singhvi, 2013. Methodological studies on luminescence dating of volcanic ashes, Quaternary Geochronology, 17, 14-25. H. Biswas, P. Morthekai, R.K. Gartia, S. Chawla, and A.K. Singhvi, 2011. Thermoluminescence of the meteorite interior: A possible tool for the estimation of cosmic ray exposure ages, Earth and Planetary Science Letters, 304, 36-44. 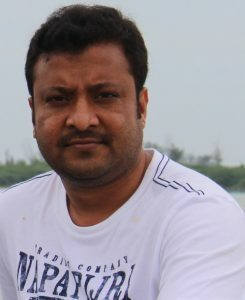 K. Kundu, M.G. Thakkar, R.H. Biswas, and A.K. Singhvi, 2010. Optical dating of sediments in Khari river basin and slip rate along the Katrol Hill Fault (KHF), Kachchh, India, Geochronometria, 37, 21-28. K. Singhvi, N. Chauhan, and R.H. Biswas, 2010. A survey of some new approaches in extending the maximum age limit and accuracy of luminescence application to archeological chronometry, Mediterranean Archaeology & Archaeometry, 10(4), 9-15. H. Biswas, M.K. Murari, and A.K. Singhvi, 2009. Dose-dependent change in the optically stimulated luminescence decay of Al2O3:C, Radiation Measurements, 44, 543-547.